Things to do in Brig! Eat & Drink in Brig! "Call Kate When Buying or Selling Real Estate"! Welcome to Brigantine NJ Real Estate! I am your full-service Realtor, representing Buyers and Sellers alike, here in New Jersey's best kept secret - Brigantine Beach! 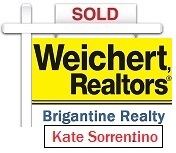 My brokerage affiliation is with Keller Williams Atlantic Shore Brigantine - previously "Atlantic Coast Realtors", one of the oldest and most prestigious Real Estate firms on Brigantine Island. My knowledge and expertise extend beyond Brigantine to include all areas of the South Jersey Shore. Whether buying or selling, I am committed to fulfill your Real Estate needs with the highest degree of ethics, honesty and professionalism. Whether searching for a house, condo, investment property, or land to build your very own sandcastle, you have come to the right place! Check out my Featured Brigantine Property Listings page. Search the MLS for every listing in Brigantine, or the surrounding South Jersey Shore areas. 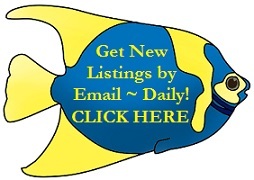 Search Brigantine Property Listings by location and or property type. Contact me anytime to discuss your real estate wish list. Together, we will find the perfect property, at just the right price and location! If your goal is to sell a property, my expert knowledge of the current real estate market, the vast resources of my firm, and my undying tenacity will get the job done. I will always go above and beyond to achieve my clients' goals! Contact me today to compile a complimentary, personalized, Comparative Market Analysis (CMA) on the property you are considering selling. This analysis will afford an overview of current local real estate market trends and property values, and is the first step in formulating a comprehensive marketing strategy. Whether you're looking to buy, sell, or simply have a real estate question you need an answer for, just let me know! Contact me today, and let's discuss making your Real Estate dreams come true! Brigantine Water Front Best Buys! $1,125,000 - BEAUTIFUL Southend Bay Front - 5 Bedrooms 4 Baths w/Mother-in-Law Suite- Large Deck and Boat Slip! $699,000 - "Sea Point" OCEANFRONT - 4 bedrooms 2 baths w/large loft - HUGE LOT! $589,000 - Bay Front Townhome - 3 bed 3.5 bath - 2 Boat Slips! $325,000 - Lagoon Front Condo - 2 bed 2 bath - Great Views! $295,000 - Brigantine Lagoon Front - "Mariner's Cove" - One Bedroom One Bath Unit! POOL! VIEWS! $169,900 - "Brigantine Beach Club - 2 Beds 2 Baths - POOL! Thank you for visiting my website! Please submit your contact information below with any questions or requests you may have, and I will be in touch with you shortly!